Sure, hunters have killed ducks over some pretty simplistic decoys. From mounds of dirt to plastic jugs painted black, there is a story out there about someone who has shot birds. And it is true; you do not need the most life-like, super realistic decoys to kill ducks. Just grab a loaf of bread and head to your local park to see for yourself! In all seriousness though, most duck hunters are chasing after heavily pressured birds and unless you enjoy shooting at ducks out past 60 yards, having the best mallard decoys will certainly have an impact on your success. If your goal is to have ducks landing feet down right in front of you, check out this article to see my top picks for duck decoys. Realistic and life-like decoys might not be a requirement when you are pass shooting ducks, but I believe it can really make a difference when you are working groups of pressured birds. Late in the season, I love setting out small spreads of my best-looking decoys and working the ducks in close. In this video (Link to video), I shoot four mallard drakes over my fully flocked Dakota Decoys all within two minutes of the first shot. Now, these ducks did not just dump right in, they worked the decoys for almost 10 minutes, slowly getting closer and closer each pass. There were endless opportunities to shoot at them as they flew overhead, and at one point there was a single that hovered twenty yards in front of me over the decoys. But I had confidence in the quality of my decoys and waited it out for the entire group to come in. When hunting hard-pressured ducks, especially on public land, you really need to have the most realistic decoys possible if you want to get these kind of in your face shots. Now don’t get me wrong, I have hunted over super cheap duck decoys with a rattle can paint job and shot ducks. But when it comes to late-season mallards, having the most life-like decoys will work to your advantage. In the video, I shoot three times and go home with four ducks. Decoying ducks in close is not only thrilling but gives you a much higher percentage shot. In the end, that means more ducks in the bag and that is something we can all get excited about. All the realism in the world is not going to help you if after three hunts the paint is peeling off the decoys. I am not overly rough on my decoys but I certainly do not baby them either. Unless you want to spend the extra time to put your decoys in individual slotted bags, they are going to be knocked around a little bit. When it comes to durability for mallard decoys, we don’t need them to be indestructible. A few scratches or a chip over the length of a season is expected. What we do not want is decoys that lose their paint over a few hunts, as opposed to seasons. I have used decoys that after one season are leaking, and almost half the paint is missing from the heads. On the other hand, my Dakota Decoys have been hunted hard for almost three years and are just starting to show some wear and tear. I imagine I will have another season yet before they need to be touched up a little. When it comes to durable decoys, it is worth the extra money to buy a quality product that will last. It will save you time and energy down the road. For some hunters, durability and realism are going to be the top factors when deciding what decoy to buy. However, if you hunt walk-in public land, size and weight are a pretty important consideration. Decoy weight can certainly add up and will make getting into those secluded, hard to find areas a real pain. But isn’t that why we love to hunt those areas? Often times, those spots that are difficult to access will be where the birds are. It doesn’t matter how life-like your decoys are if you are hunting a pond right by the road and the ducks want to be in some back-water marsh that is a mile walk in. When it is not feasible to access a spot with your typical mallard decoy, consider going with different options. You can always lighten up and take fewer decoys, but there are some other choices that can help you save on weight and space. A combination spread of windsocks, shells, or even silhouettes can make a big difference in the accessibility of some locations. There are a lot of options for name brand, high-quality duck decoys on the market right now. A lot of it comes down to personal preference, but you will be hard-pressed to find a better decoy than this. If you compare the appearance of these decoys to almost any other style, the Dakota Decoys will stand out. Instead of the typical one-piece design, these heads are able to swivel 360 degrees giving you the most options for head placement. 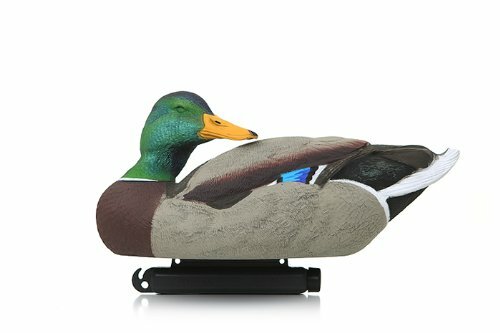 Additionally, the design of the head has a much higher profile than other decoys, which makes it look nice on the water. In my opinion, these are some of the most realistic looking decoys that are available. This package comes with twelve decoys and the drakes have flocked heads. The flocked heads on these decoys look amazing and really make the decoy stand out. The manufacturer also makes an option that is the same, except the drakes, are fully flocked. One thing to keep in mind is that while the fully flocked decoys do look better than the ones with only the flocked heads, they are a little tougher to keep nice. The flocking can get muddy fairly easy, and you have to be a little careful cleaning them off. I have hunted over both the painted decoys and the fully flocked decoys, and you really cannot go wrong with either choice. The appearance and durability of these decoys are truly outstanding. If you are tired of replacing cheap decoys that look worn out after just a few hunts, I would suggest you look into purchasing these. The initial cost is going to be a little more, but you end up with a better product that will last you many years to come. Goes through 24 step painting process resulting in a very realistic decoy. Available in painted or fully flocked. These are not cheap, budget decoys. Expect to pay a little more, but the quality is well worth it. I am sure you might be wondering how a goose decoy ended up on the list for best mallard decoys. Interestingly enough, mallards love landing with geese and adding some goose decoys to your duck spread can really be a game changer. Most of my hunts are on public land and space for decoys is at a premium. That is why I use these Higdon goose shells. I can take six of these shells in about the same space as two of my mallard decoys. The larger size and black heads stick out better than the mallard decoys. This makes your spread more visible and draws the attention of the ducks. For whatever reason, the ducks really like landing in with these goose decoys. I really like to use these when there is a lot of pressure from other hunters as it gives the ducks a different look and can really make an impact on the success of a hunt. If you have never hunted ducks with some goose decoys in your spread, I have to recommend you give it a try. I think you will be impressed with the results. These shells are an excellent place to start as well. They have all the qualities of the expensive decoys at a fraction of the price. The heads are flocked, durable, and easy to take off and put on in the field. The heads on mine are removed after each hunt in a matter of seconds for each decoy, and they are just as easy to put back on. The paint has held up well for me as well. They are not oversized which is why they come in at a cheaper price point, but this works in our favor for packing them in. Now it is important to note that these are shell decoys so they do not float on their own. And if you have room in your boat, I would recommend you buy floating decoys from the start. But if you are like me and space is limited, you can turn these into floaters by putting pipe insulation around the base of the decoy. This is an awesome way to add visibility to your decoy spread without a lot of extra weight. Give it a try this season and I do not think you will be disappointed. Heads are easily removable, even with cold hands in the dark. These are stackable, making them the ultimate space-saving decoy. Outstanding quality and all the features of the expensive decoys at a fraction of the price. These are not floating decoys so you must add some pipe foam if you want to use them on the water. Decoys are 21 inches long, so they are not oversized. 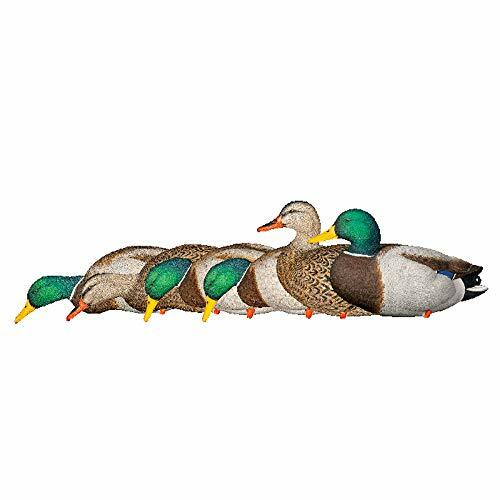 Avery Greenhead Gear is a fairly well-known and popular brand of decoys. Their Hot Buy options are an excellent way to pick up some decent decoys without breaking the bank. 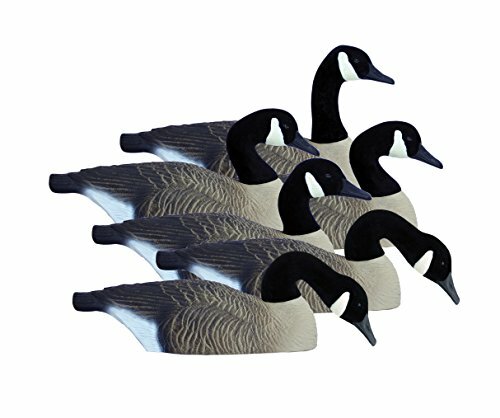 These decoys are a molded plastic, painted, one-piece design. The heads are all low profile on both the hens and the drakes, so you do not get any variety. However, for the price, they offer a realistic looking decoy. These are certainly not the cheapest mallard decoy that you could buy, but it is a reasonable middle ground where you get a nice decoy at a budget price. If you are hard on your decoys or plan on doing a lot of hunting, the paint on these probably won’t look very good after the first season. These work great as a filler decoy, or if you are ok with some scratches and chips. There is nothing to get really excited about with these decoys, but they will certainly do the job. I own a handful of the Hot Buy decoys and used them to cut up and put a weasel ball inside. This was a cheap way to get some added motion in my spread. A great option for the budget-minded hunter, or if you don’t mind doing a little touch-up painting in the offseason. Decent quality decoy when you consider the price. The paint is not very durable. This Avian X Full Body package comes with six decoys and a heavy duty individually slotted decoy bag. The slotted bag will come in handy as these are some pricier decoys and you won’t want them knocking around against each other. That being said, they feature a rubberized molding material that holds paint extremely well. It won’t be easy to pack a lot of these in somewhere, but they will really add some realism to your spread. The contrasting paint scheme also helps to make the decoy stand out better in the field. Full body duck decoys are mostly used for field hunts but can also be very effective in shallow water or along the edges of ponds. They can also be used late in the season on ice if you can find open water. However, these decoys utilize stakes instead of stands. If you want to use them on the ice, try using a quarter inch drill bit to quickly drill a hole. The nice thing about stakes is that you do not have to worry about them blowing over in high winds. If you hunt a lot of fields or shallow water, adding some high-quality full body decoys can give you that extra edge. I think you will be impressed with both the durability and realism of the Avian X Decoys. Full bodies give you that extra bit of realism. The decoys are durable and hold paint well. Even a six pack of these decoys is fairly expensive. 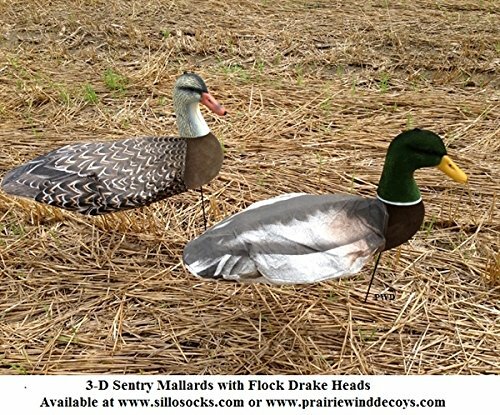 If you are looking for a way to cut some weight out of your decoy spread, consider picking up these Sillosock Mallard Decoys. The windsocks come in a package of twelve with eight flocked head drakes and four hens. One nice feature is that they come with stakes, so they can be used in both fields and in shallow water or on the edges of ponds. If you hunt open water though, you will not be able to use these decoys. These windsock decoys are lightweight and setup and teardown quickly. I like to place them around the edges, or mix them throughout my spread if I am hunting in shallow water. With a light wind, you get realistic motion as the decoys bounce around. Using these decoys will and depth to your spread and natural looking movement. Not only can they help you save on weight, they give you that full body look at a cheaper price point. Adding some windsock decoys can make your spread more versatile and help it stand out from the hundreds of similar looking decoy spreads. These decoys might not fit every hunting scenario, but they do have their place. With a light breeze, these decoys will give you excellent realistic motion. Great option if you are looking to add full bodies to your decoy spread. These are held in by stakes so they only work in shallow water or dry ground. Whether you are tired of hunting over cheap decoys that don’t hold paint or are just getting into hunting and want to start off with some great decoys, you should be able to find something that fits your hunting style. If you are looking for the best mallard decoy for the majority of situations, I have been extremely impressed with the quality of the Dakota Decoys. All of the other decoys listed in this article are great additions to any spread, but if I could only hunt with one setup it would be with the Dakota Decoys. Hunting on heavily pressured public land means I am always looking for a way to get a step ahead of the competition. I truly believe that having high-quality decoys makes it easier to pull in wary birds. Mix it up and add some of these best mallard decoys to your spread this season, I think you will be glad you did.